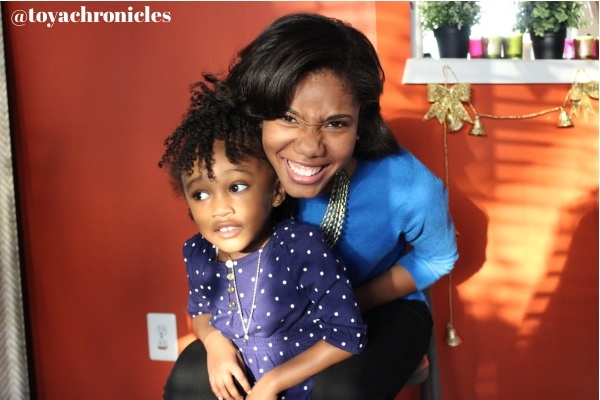 What My Daughter With Cancer Taught Me About Self-love & My Own Insecurities | Natural Hair Rules!!! Update: My daughter receives her last round of chemo on Good Friday and all her scans are great! We will be celebrating her birthday (CANCER-FREE) on Easter Sunday! Amen! Last week, I cut off my daughter’s hair –what was left, at least. She has cancer. She was diagnosed last spring. Since then, I have been bracing for this day. The doctors said they’ve never seen someone’s hair hold on like hers did. Initially, it thinned a bit and she lost her edges. But after Thanksgiving, it fell out in clumps. She was left with a “George Jefferson”. So, for weeks, in fear of her reaction, I left it alone. When I washed her hair, she still shook her hair and said, “Shake, shake, shake” like she still had a full head of hair. Finally, I said enough is enough. On my first attempt, I quickly sat her down before I lost the nerve. As I took the scissors to her hair, she asked, “Mommy, what you doing?” She then played with Tinkerbell and said, “Tinkerbell, don’t touch her hair.” Needless to say –with tears welled up in my eyes — I chickened out. The next day, I waited until she was asleep to cut it off. It looked choppy, but it was done. The next morning she had no reaction. So that evening, during bath time, I used a fine tooth comb and scissors to even her hair out. I took her out the bath and we looked in the mirror. I expected her to be distraught. Instead, she said, “Hi guys! How you doing?! ?” She was amused by her reflection and unfazed by her hair. I know that she knows her hair is gone. I recently straightened my hair and she said, “Mommy, I like your hair!” She gave similar compliments to my sister when I installed twists and when her little sister got cornrows for the first time. And today she said, “My hair is gone.” Taken aback, I asked, “What?” She quickly changed her tune and said, “My lips are dry.” So she knows. But in many ways, I think she is protecting me from my own insecurities. It was then, that I realized that she was well aware of MY insecurities. (And she’s only two!) Without even realizing it, I was displacing those insecurities onto her. Little black girls don’t come into the world feeling insecure about their looks. They learn it from mom, dad, their peers and society. They then grow up and they become their own. This, by far, has been the most challenging year of my life. But through all of the tears, I have learned many life lessons. And one of those many life lessons is self-love. True self love. One that overcomes fear and doubt. And one that recognizes the strength within. And surprisingly, I learned much of this from my little girl. I vow to do all that I can to make sure that she never loses her courage, her fighting spirit, and her confidence. So she sees beauty in every scar and looks back at every picture with pride. Because one of my main goals as a mother, is to teach my daughter self-love. What are some of your insecurities? How do you plan on teaching your daughters self-love? What a beautiful little girl. She is an inspiration to all of us. Can’t stop tearing up.